Tel Aviv activist Sheffi Paz is re-arrested, Im Tirtzu CEO Peleg says Supreme Court's activism endangers Israel's democracy. 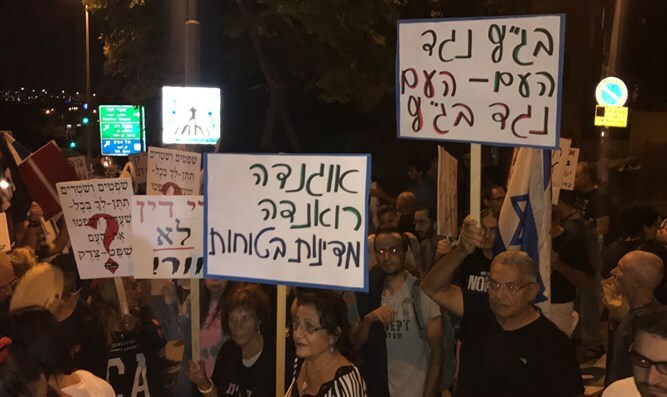 Approximately 200 residents of southern Tel Aviv, together with the Zionist "Im Tirtzu" movement and supporters from all over Israel protested on Saturday night opposite the northern Tel Aviv home of Supreme Court Chief Justice Esther Hayut. In their protest, demonstrators insisted Hayut put an end to the continued disrespect for the human rights of southern Tel Aviv's Israeli residents. Slogans included, "The Supreme Court opposes the nation, and the nation opposes the Supreme Court," "A third country, and Israel is free," "The nation is sovereign," "Take your hands off the Deposit Law," and "Justice for South Tel Aviv." The Deposit Law deducts 20% from infiltrators' salaries, in an attempt to encourage them to leave Israel of their own accord. The infiltrators receive this money when they agree to leave Israel. Last Saturday night, activist leader Sheffi Paz was arrested after demonstrators insisted the Supreme Court cease involvement in the government's efforts to legally remove the African infiltrators from southern Tel Aviv. In August, the Supreme Court ruled that infiltrators may only be deported to a third country if they agree to leave, and may not be imprisoned for refusing. Paz was released with a distancing order forbidding her from nearing Hayut's neighborhood for a period of 15 days. However, she violated the order Saturday night in order to attend the weekly protest. Just prior to her re-arrest, Paz said she did not see herself as obligated to obey the order, since it does not see her as a citizen with equal rights. "I did not easily choose to violate this distancing order, and it was not out of disrespect for the law or police," she said. "Instead, I violated the order because my moral order forces me to stand here and hurl the enormity of this injustice, which is tearing our souls apart, in the faces of the authorities and all of Israel." "In a statement published last week after my arrest, Israel Police said, 'Israel Police will allow freedom of protest, but will show zero tolerance for violence and disruption to civilians' normal lives. Zero tolerance. And since the police have, for a decade, shown great patience for violence and harm to the lives of southern Tel Aviv's residents, we must ask: Does this mean that we are not citizens? In my opinion, this hurtful, condescending, and illogical sentence frees me from having to sign the distancing order. "If harm done to the normalcy of Israeli citizens is a reason to arrest me and distance me, then we insist on the arrest and distancing of every single infiltrator. Until then, blockades, arrests, and orders will not help.I will come back here and I will disrupt the lives of anyone who, unlike us, is considered a 'citizen,' until the infiltrators are distanced for the continuous and irreversible harm they cause the lives we loved and no longer have." Im Tirtzu CEO Matan Peleg noted, "It seems the Supreme Court has lost control of itself, and has lost its professional honesty. Its activist rulings are political and tendentious, and the first ones to suffer are the residents of southern Tel Aviv. At the same time, we emphasize that the current situation, in which Supreme Court justices act as supreme rulers and a council of wise men, harms every Israeli citizen and severely endangers Israel's democracy." The demonstrations are held to protest the Supreme Court's refusal to deal with nearly 40,000 African infiltrators. These illegal infiltrators, many of whom receive National Insurance benefits which Israelis have taken off their salaries, have caused a significant rise in crime, making life in southern Tel Aviv unbearable for residents. Their children, "anchor babies," take over Jewish kindergartens and receive state-of-the-art facilities at residents' expense.